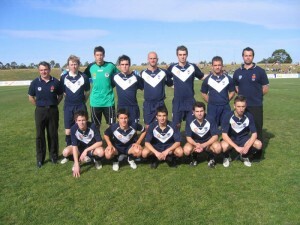 Melbourne Victory Youth squad versus Queensland Roar at Green Gully Reserve on 26 September 2008. Back row, left to right: Mehmet Durkaovic (Coach), Robert Wynne, Mijo Marinovic, Nathan Elasi, Steven Pace, Milos Lujic, Daniel Vasilevski, Steve Mautone (Assistant Coach). Front row: Matthew Foschini, Mathew Theodore, Aziz Behich, Steve Pantelidis, Ante Cicak. Photo: Milan Ninovic. On a dry, bumpy and windswept pitch at Green Gully Reserve, Melbourne Victory went down by two goals to nil in the opening match of the new National Youth League on Friday, 26 September 2008. The Victory squad was only finalised this week and though the players had been together for the best part of a month, the home team was clearly struggling to find cohesion. In the first half Victory looked reasonably sound in defence but could not create much in attack and it was the 38th minute before Nathan Elasi had a shot which came back off the post with Roar keeper Griffin McMaster saving Steven Pace’s attempt to put away the rebound. The Roar was more adventurous particularly on the flanks but crosses were often overhit in the blustery conditions and the first half ended scoreless. Queensland coach Rado Vidosic brought on Josh McVey for Michael Angus at half-time and the move paid off five minutes later when Mitch Nicholls, the man of the match, worked his way along the bye line and found the substitute on the edge of the area. McVey thrashed a shot into the top corner. Two minutes later only a great one-on-one save by Victory keeper Mijo Marinovic prevented the Roar going further ahead, but the big custodian, who had looked extremely sound up to that point, then tried to dribble round Nicholls. He lost the ball and Nicholls walked it into the empty net. Victory raised its game in the last ten minutes and Elasi drove narrowly over, while Queensland was reduced to ten men after Ben Griffin pushed Milos Lujic in the face. Rado Vidosic was pleased with the three points and the overall performance of the whole squad. An interesting difference in approaches emerged from the remarks of the two coaches. While both are concentrating on the development of their young players, Durakovic said he was trying to get his charges to play in the same style and structure as the senior team so that young players could move up knowing what was required. Vidosic on the other hand was emphasising adaptability and getting players to take on different roles so that they could appreciate what was needed in other positions on the field. Also Roar Youth will play a number of their games as curtain raisers at Suncorp Stadium, while Victory Youth will rotate around a number of Victorian Premier League venues. If the Youth League is to get the exposure it deserves and the youngsters are to have the best possible conditions and atmosphere to play in, the Roar approach is much preferable.